Review: "Nero Di Marte: Nero Di Marte" - Sea of Tranquility - The Web Destination for Progressive Music! This here's the self-titled debut album from Italy's Nero Di Marte....well, sort of. You see, the band, who formed in 2007, were originally called Murder Therapy and had a few albums under their belt under that moniker, but when they signed to Prosthetic Records recently and began working on the release Nero Di Marte (the god of war), they decided to change their name to that as well. Good call if you ask me! The music here on Nero Di Marte is bold and powerful, chock full of tight rhythms and intricate guitar work. 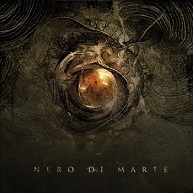 Somewhat like a meeting of Mastodon, Gojira, Meshuggah, and Tool if that makes any sense at all, though Nero Di Marte takes those apparent influences and creates a totally new beast. Complex guitar riffery and busy rhythms on "Time Dissolves" takes the listener on a fascinating journey, while the pummeling stop/start arrangements on the brutal "Convergence" brings to mind Gojira as well as classic Gorguts. Sean Worrell's vocals are well done, not quite a death metal growl, but certainly not overly clean, and along with his fellow axe slinger Francesco D'Adamo, the two create plenty of prog & metal guitar mayhem throughout the album. "Resilient" is a monster of a track, with drummer Marco Bolognini & bassist Andrea Burgio really laying down some jaw dropping, crazy complex poly rhythms underneath plenty of textures and thunder from the two guitar players. The near 13-minute title track takes the band down experimental avenues, as they mix the extreme metal and prog quite nicely (some killer riffs here), while "Anoptikon" oozes with post rock bleakness before some maniacal, blast beat driven death metal crushes the listener into oblivion. It's safe to say that this Italian band really impressed the hell out of me with this release. Prosthetic Records certainly has a find on their hands, and with this kind of talent there's no telling how good Nero Di Marte are going to get from this point on. If you like progressive extreme metal with lots of experimentation, you need to hear this one!